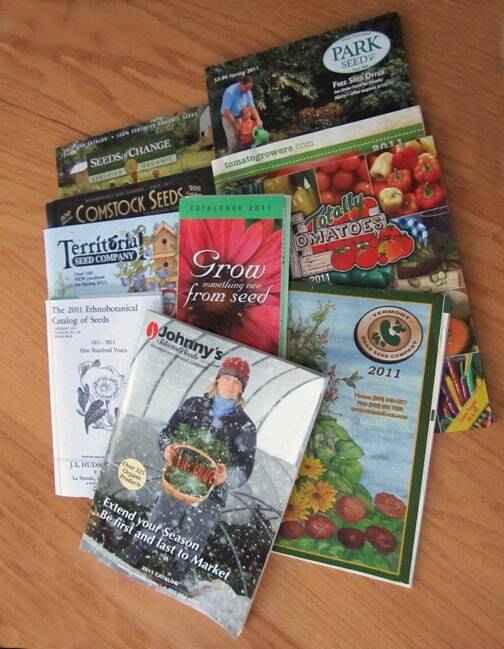 If you’re willing to start seeds, this is a good time to be a gardener. I remember in my early gardening days there was Thompson & Morgan, Burpees and Parks Seeds and for backyard gardeners that was about it. Catalogs such as J.L. Hudson, Seedsman existed, but weren’t on a new gardener’s radar. Now we can order from organic seed companies, specialty catalogs (Totally Tomatoes), and those with a focus on heirlooms to name just a few. I’ve already sent for zinnias from Renee’s Garden Seeds and many pages of my Johnny’s Selected Seeds catalog are turned down in preparation for a vegetable order. The problem these days usually isn’t finding something that you want…it’s being disciplined about buying. On a mid-January day anything seems possible and it all looks desirable. The realities of limited space and time are far in the future, and it’s easy for plant-lust to rule. At this time of year, we might debate that word, “need”. Should we not waste seed or the food it produces? Agreed. But do those small packages of seed provide intangible qualities such as hopes, visions and curiosities? Absolutely. And for the price of a few packages of seed, the promise of these is priceless.